If any salad that I do epitomises summer I would say this is it. Sure, you can make this salad at any time of the year, especially if you want to feel summery while curled up in a warm duvet and hail ricochets down your chimney. But, it just won’t be the same, not without local grown-for-flavour corn and tomatoes. Out of season tomatoes can be pretty. But pretty insipid. And corn, well if you get out of season corn that tastes of anything other than the little cardboard tray it often comes in, that’s a result. No, this salad, and any salads that major on sun-ripened vegetables, should really only be eaten in the summer and early autumn. I wouldn’t pass a law or anything but common sense tells us that food grown locally and in the right season tastes better, is better for us, is cheaper and of course is better for the environment. There have to be some exceptions though. If you live in warm temperate climes, no excuses. But if you are cool temperate like we are here in the UK, this would mean turnips and other gut-challenging crops for a good portion of the year. No offence to turnips. We can’t grow citrus, juicy melons, mangoes, ginger; these always need importing. Yes, I know we don’t have to have things we don’t grow, but in some parts of the world strict adherence to local would make varied diets and optimal nutrition much more difficult – and do, especially for those without much money, culinary skills or nutrition expertise. And our nutrition has increased as globalisation has increased (along with obesity rates I should add), so some food miles aren’t always a bad thing. Contentious statement, I know. We should, however, make the most of what we have, in the time nature allots our crops. If that means we aren’t eating strawberries at Christmas or asparagus for Valentine’s Day, is that really so bad? More and more I am trying to buy local. And judging by the numbers of farmer’s markets and ad-hoc stalls that are springing up, and the queue for a garden allotment plot in Edinburgh, I am certainly not in the minority. Most of what’s available seems to be aimed at the well-to-do, but there are some schemes that are trying to make locally grown produce affordable and available to anyone. In truth I box and cox between such stores as Lidl, Waitrose and Morrisons for the majority of my shopping, but I am increasingly spending my pounds and pence (mainly pounds) at such places as the Stockbridge Market, Earthy and even the tiny food counter in my also tiny post office (they supply local bread and other goodies). I hadn’t meant this to turn into a mini rant/polemic, especially as I need to go to work in an hour and I am still sitting in sweatpants, but there it is. What is your take on eating seasonally and locally? How easy or difficult is it for you and your family to eat this way? What do you do in more fallow months? I’m sure lots of you have opinions on this so I would love to hear from you. Btw, Jean-Francois, over at 222 Million Tons, has lots of articles and opinion pieces on eating sustainably for ourselves and our precious planet, with a cool new menu app. And he’s a lovely guy too. I am sending this over to the talented and generous Karen at Lavender and Lovage for her Herbs on Saturday challenge. Lots of delectable looking recipes already over there. Miss R’s Track of the Week: Jake Bugg’s ‘Taste It’ – love, love, love this song from the young, oddly-named English singer-songwriter. Reminds me so much of early The Who. There are too many nutritional goodies in this recipe to hone in on just one. Suffice it to say that, as well as being colourful, filling and delish, it will leave you feeling glowing with vitality. Great for picnics and lunchboxes too. PS You will see that I’m not Metric this week. I don’t want you or me to be constrained by exact measures when it comes to salads. Baking? Heck yeah, precision is key to a good result. But for salads, cups and handfuls are fine. Firstly, cook the quinoa. Rinse the quinoa for 30 seconds in a sieve, stirring it with your hands, and pop into a small lidded saucepan. Pour over 1 ¼ cups of cool water or light vegetable stock and, on a medium-high heat, bring to the boil. Cover and let the quinoa simmer for 10 minutes. 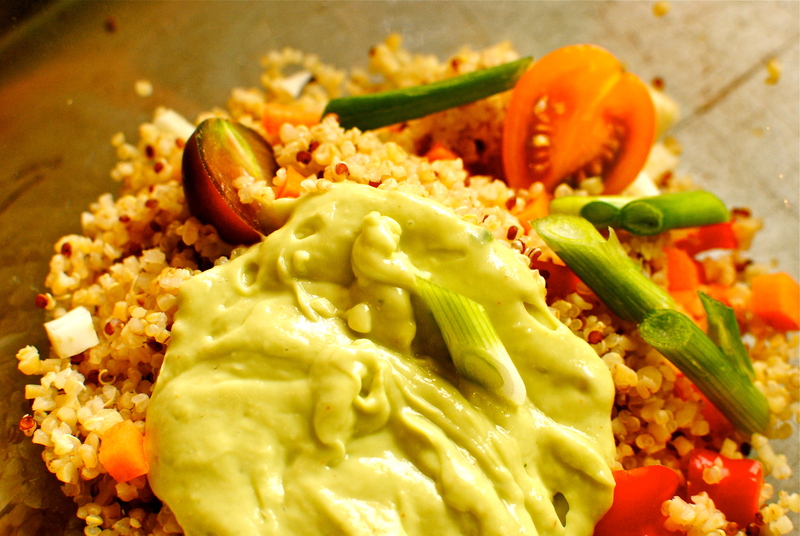 Remove from the heat and let the quinoa steam with the lid on for a further five minutes. 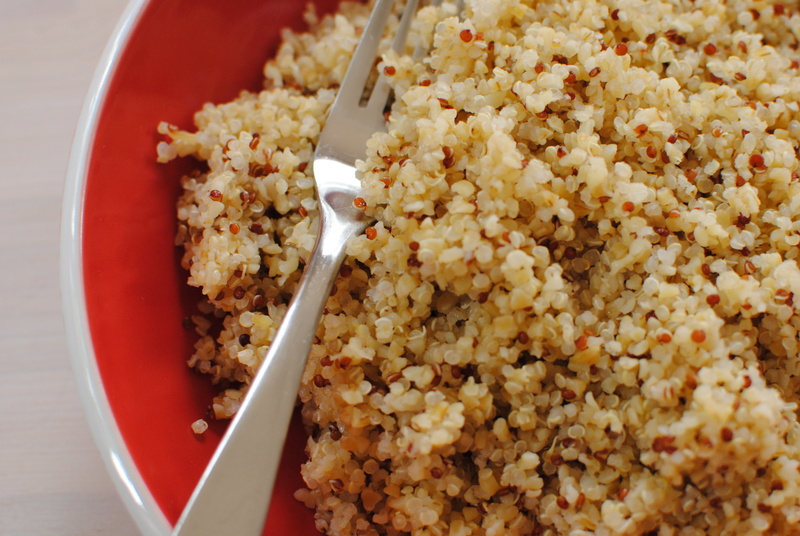 If you were going to have the quinoa hot as a side dish you would add a few more tablespoons of water and simmer it for a further 10 minutes. Let the quinoa cool in a sieve but no need to rinse. Now the rest is just as easy. Take a non-stick frying pan or cast iron skillet and heat until very hot. 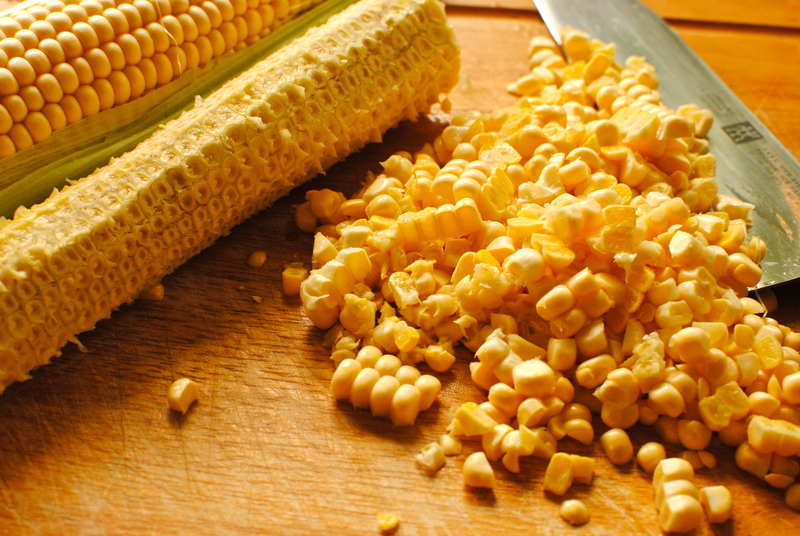 Using a sharp, heavy knife upend each ear of corn and carefully slice down where the corn meets the cob. Scrape the milky kernels into the hot pan and toast until it smells a bit like popcorn, and is a bit ‘caught’ in places (not burned!). This would also be fabulous – better even – with leftover outdoor-grilled corn. 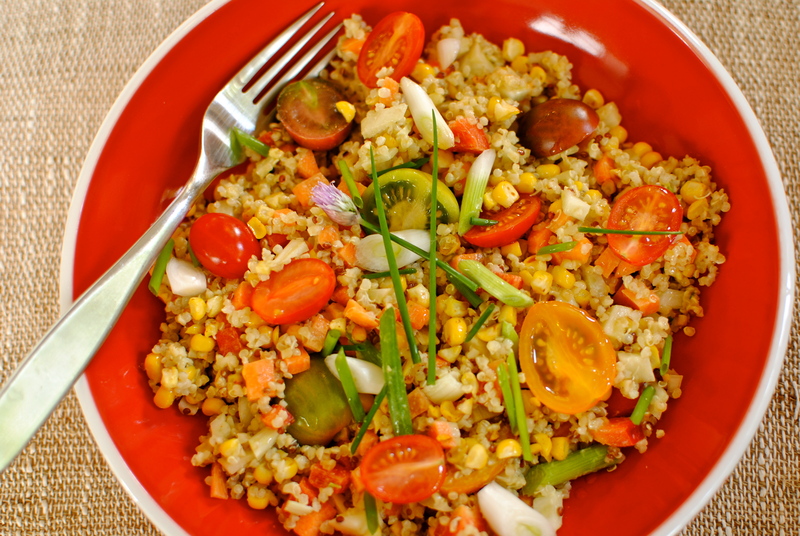 Put the corn and the cooked quinoa into a large bowl with the remaining vegetables and the chives. For the dressing, pop the ingredients in a food processor, blender or use a hand/immersion blender. Pulse until smooth, adjusting the seasoning, sharpness and liquidity as desired. You don’t want it too wet. Pour the dressing on the salad and fork it through. Serve at room temperature with extra chives. This salad makes enough for six as a side dish or two to three for a light lunch. It keeps well for lunchboxes too, with maybe some extra green salad and a couple of tablespoons of cooked beans or lentils to make it even more filling. Less calories: use ½ the avocado and make up the dressing with enough water and lime juice to be pourable OR make a buttermilk based dressing with ½ c buttermilk, 2 tbsp cider vinegar, pinch of sugar, salt and pepper, tsp of Dijon mustard and chopped herbs. Add in a few slivers of fresh avocado to each salad serving so as not to feel deprived. YOU to the rescue! I am attending a luncheon with some friends and needed a gluten-free sugar-free vegan dish to bring. (I will leave out the agave) I have a bowl full of tomatoes I just picked and I’m selling at the market tomorrow so I can get the chives cucumber and onion. Corn season is over for us down here 🙁 so I’ll have to use frozen. This is the first year I have really made an effort to eat locally and seasonal. I love it and it’s forced me to be creative based on what I get at the market that day. Next year I plan to buy BIG and freeze and/or can lots of things…corn included as we grown the sweetest varieties…silver queen and peaches and cream variety. This year I bought cases of fresh local peaches (I’m from Georgia…the peach state) and they were so easy to freeze. Now I have them ready when I want them for smoothies and recipes. Always a pleasure to see you in my e-mail inbox! Thanks! Kindred spririts – I love ‘putting up’ when I get the chance. Which might be this weekend as I have a family-free house (they are camping). I used to adore Georgia peaches> We used to travel up to some church camp thing in my youth and drove through Georgia from Florida to get there. A long, boring, hot journey but we all perked up when we stopped at a peach stand. Happy days. And more memories of shucking tons of Silver Queen in my grandmothers backyard, fending off the hens and wishing to hurry it all up so she would go in and boil it up. I made this today for some friends and it turned out great! Everyone loved it and I will be making this again 4 sure! Thanks for sharing! Fantastic! I always have a wee worry when I know someone is going to actually make one of my recipes. And I really worry when I know they are trying it but then I don’t hear back! So thanks so much for letting me know. Other than dropping the agave did you do any savvy sister tweaks? Yes, you really are a local and seasonal advocate. Love those recipes best, although I like looking at the baking pictures and drooling! This looks absolutely beautiful. It’s nearing the end of corn season here and I’m so sad to see it go! It’s never really corn season up here in Scotland but the English crops are still on the go. In Italy the corn fields are a sight to behold, especially in the context of the groves of olive and fruit trees. I agree about eating seasonally and locally as much as one can because out of season tomatoes are just bad here in Minnesota! But, like you, if I only ate locally all winter I would live off of root veggies (including many, many turnips) for 4 or 5 months. I really tried one year and it was incredibly repetitive (which is not great for my digestion) and I started feeling guilty about wanting a mango! In other words, I do make a few compromises in the winter months. I would rather eat the mango than get into a seasonal, low sunlight related funk worrying about eating the mango! We are very lucky, though, to live in a place with many organic, local foods coops (anyone can shop at them and one does not necessarily need to be a member), farmer’s markets and CSA farm share options aplenty. When we travel to other parts of the US, though, especially to visit our families, it can be more of a challenge to find local stuff particularly in the winter. I always try to make it work and the US is getting better but it is not always possible. Also, I still love that your post office has a food counter! I am so with you. We have a neighbour from Minnesota and you all have such extremes, boiling hot summers and frigid winters. That must make for quite tricky growing seasons. And I am with you about having that mango, or avocado. Especially in the winter you need to have those little doses of ‘food sunshine’ but only if it’s good quality and special. That’s a good reason to preserve when their is abundance, so we have special treats that keep us sane through the long winter months. That and hot chocolate! 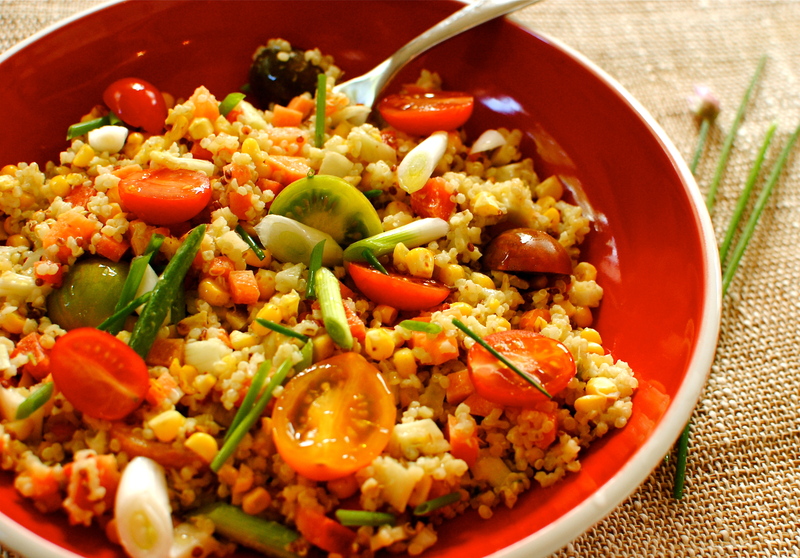 Gorgeous summer salad, and looks like a great make ahead dish. 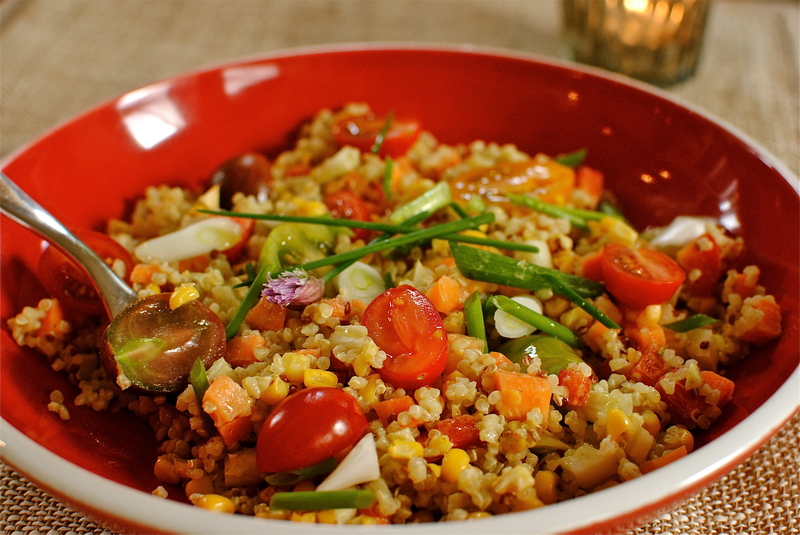 I always love quinoa salads more the next day after all the good flavors have had a chance to meld together. Over the past couple of years, I have really increased my efforts on buying local, in-season produce. I will admit, though, that living in So. California which has a long growing season, I am very spoiled indeed! Pinning this to make soon! You’re right about the next day thing but it would depend on the dressing. I would give this an extra squirt of lime and a drizzle of olive or avocado oil to freshen it up the next day. Quinoa is about the most leftover friendly grain/seed I can think of as it doesn’t lose it’s texture. Along with its nutrition profile and taste, that’s a big plus. I am envious of your long growing season. Hailing from Florida I know how great that is. My sister can grow tomatoes in early spring! Looks amazingly delicious! My little girl is gluten free and we are always looking for new Quinoa salad recipes!!! Thank you! You are very welcome. We love quinoa even though we have no food intolerances. It is tasty on its own of course but really comes to life when herbed up and slapped with some seasonal vegetables. Thanks for stopping by. 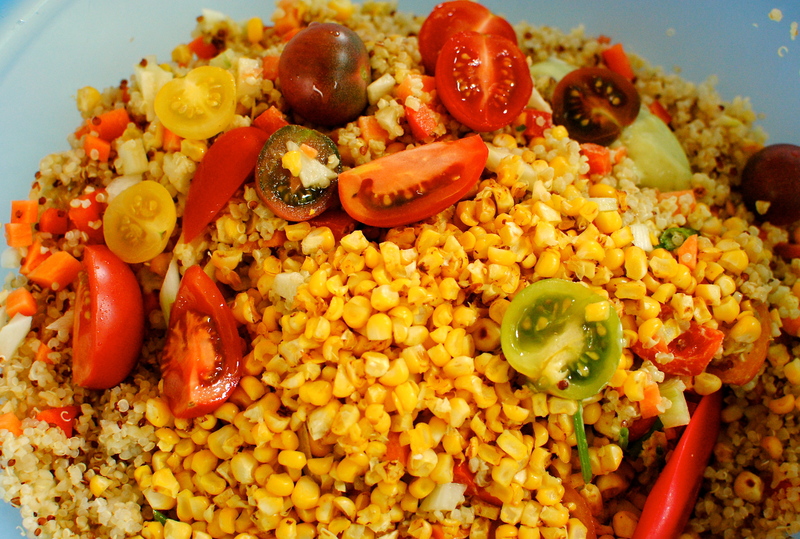 What a perfect salad, screaming summer with tomatoes and corn! It is easier to obtain locally grown food for a longer time period here in California. And I have already made jam this summer. Waiting on the tomato glut to make salsa and sauce for the winter pantry. But I do frequent the supmarket for staples, whims and when pressed for time. I will admit to liking the convience of the grocery. Don’t we all? I won’t go on about how lucky you are because you know that already 😀 But I feel pleased that I’ve made several batches of jam, totalling 26 jars (not counting the two we’ve already had). Once I start jam making it is hard to stop if there is still seasonal fruits to be had, and our berries are tip top. Italian apricots glowing brightly on the worktop, waiting to be smothered in sugar and vanilla today. 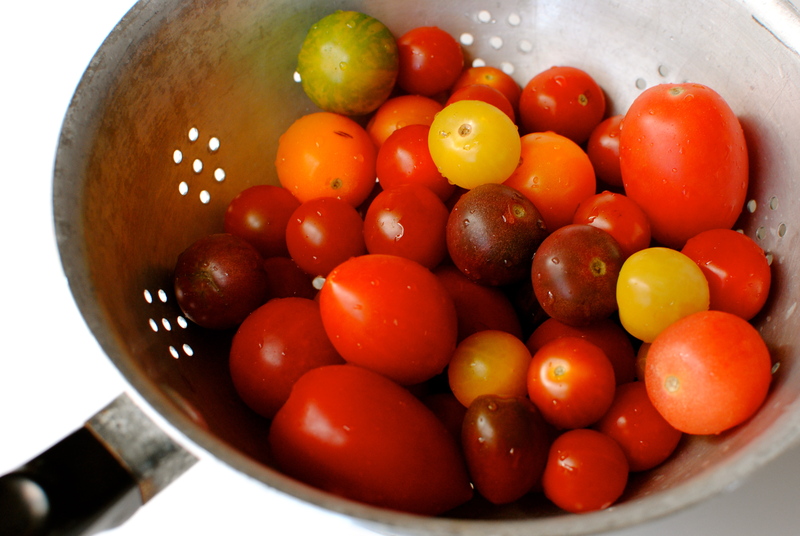 And, mmm tomato glut – a welcome phrase if I ever heard one. That salad looks fresh and hearty. It’s hard to beat the combination of corn, tomato (am just discovering the wonders of the heirloom varieties) and avocado – one that’s pretty popular here in California. We’re fortunate in that each of those is in season at least 8 months of the year. Being a locavore is far less of a hardship in these parts than it was in Canada or Japan. Thanks for mentioning the 222 million tons blog and app. I’m back in town and in my kitchen for 5 weeks, and playing with our new tofu maker this weekend, so expect I’ll have much to share while I’m here. Tofu maker: that’s impressive. I look forward to a post on your new plaything! And, of course I was happy to mention 222 million tons as it was appropriate to my semi-polemic (I’m too timid to state an actual polemic). I hope you get a few more clicks from me. You have a wonderful site. I have a really Sweet Award waiting for you come pick it up over here and Enjoy! Thanks so much Eunice. Lovely to be recognised by a classy crafter such as yourself 😀 Anyone reading this, go visit nuts for treasure and get inspired to get out the glue gun and make something pretty. 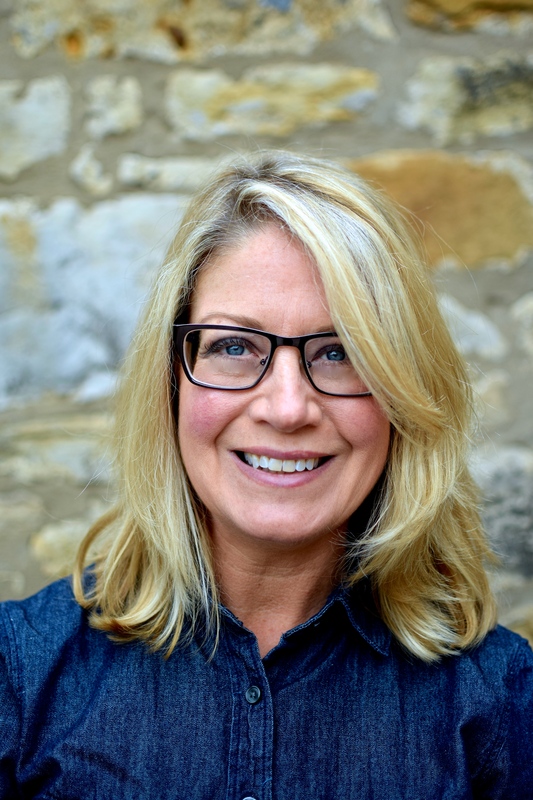 Happy to have found your blog! That salad looks heavenly. I love both quinoa and corn! Well thank you for finding me, Brandi 🙂 I hope you like what you see. I think it’s definitely important to eat locally (and therefore seasonally) as much as possible given a person’s unique situation and location. There are so many benefits to it, right down to the fact that it just tastes better. This salad is a real stunner. 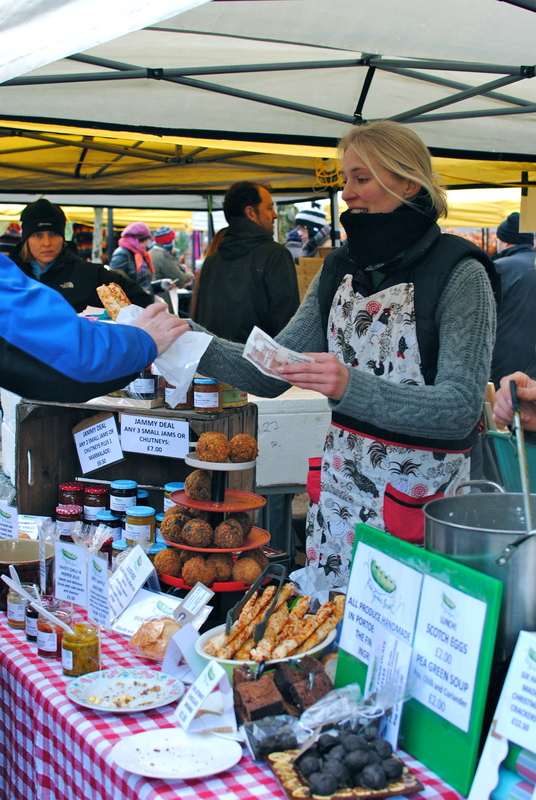 Taste trumps other benefits for me (but I am a greedy so and so) but supporting the local economy, cheaper to buy, encouraging heritage and grown for taste varieties, better nutrients, less freight-weight, the feel-food factor – all important. I hope I would be able to tell in season produce from not. I bet you could, Faith! PS I am eating a massive – and I mean massive – bowl of homemade borscht and it is amazing. Too bad I am rubbish at photographing dark food but no doubt I will share it, rubbish photos and all. I wish I could borrow you and your camera for an afternoon because you are always spot on in all aspects of your blog. Thanks Susann. I am not about diet food as such (as you would see from the jam recipe and the ice cream one) but most things have a healthy spin in some manner or other. Absolutely. I am all about a little of what you fancy, otherwise its a straight road to cravings and guilt. No need for that! If you are wanting to lose weight have a look under the nutrition and cancer bit along the top and you’ll find some pointers suitable for anyone. Thanks so much for commenting. I wish you would open a chain of cafes in London.! ALL OF your posts are really attractive and I really would like to find a place that cooks decent food. I was very disappointed last night at my local bar in Herne Hill , I thought I can’t go wrong with Hake FishFingers. fries and crushed peas. I wanted something simple. They were the worst fish-fingers ever! THEY were not fingers even, they were like fritters and really oily. I’m mainly a vegetarian but do eat a bit of fish, but I am finding it hard to know what to eat anymore as the choice is so poor in all the bars, and the restaurants aren’t much better. The only good vegetarian cafe that I know of is Food for Thought in Covent Garden but it is out of the way and very small and over crowded..
ok when I win the lottery can I employ you?, and I will open a string of cafes called FOOD TO GLOW!! Gosh, wow. I don’t know what to say! My family would probably like to get rid of me so they could eat something normal like baked beans on toast, so that sounds quite fun. But I am FAR too lazy to open a cafe or restaurant. And I have no business sense whatsoever, so even if I could get a few folk trickling over the doorway (I would be counting on you to pull the punters in) no doubt I would still end up in debtor’s prison or the modern equivalent. But I will look at this comment when I am feeling down or in need of a morale boost. Thanks so much, Julie. PS I’ve got some quinoa and smoked mackerel fishcakes on the blog somewhere. Not quite you are looking for but they are dead tasty! Colorful and expertly done! I’m making this for a get together Monday. I’m sure it will be a hit! Ooh, let me know if you make it and how it went down. What’s the occasion? Don’t mind me I am a bit nosey. Pingback: The Big August Herbs on Saturday Round-Up and we Have a Winner!